Buy a discount voucher for 10 points and get a 20% discount from Hard Rock Cafe. To get a discount, buy a discount voucher and present a discount voucher code on the spot! 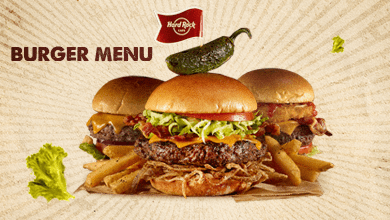 The delicious Hard Rocker Burger Menu for Gulf Club members only for 14.40 GEL. The offer is valid every day from 12:00 to 17:00. Submission of voucher is required. 1 voucher will receive a discount on 1 menu. Buying additional voucher is required to purchase additional menu.